Just a quick post today because I’m super busy with getting the affiliate program off the ground for my eBook. Since I launched it last week, over 200 people have signed up as affiliates and the sales are going great. Thanks! Just a reminder, every sale makes you $17.10 USD which is paid monthly via PayPal. 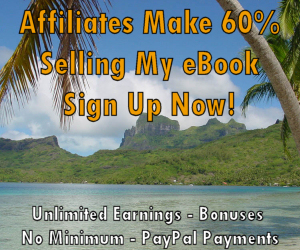 There are also no minimums to hit, so you can make one sale and get paid. Sign up by clicking the banner on the left of this post. Again, thanks to all of you that have signed up and who are making sales. This is a really great converting eBook and is great for beginners, so send it out to your e-mail lists, Facebook contacts, blog about it etc. Also, the contest I mentioned earlier is still going on. Whoever can make the most sales by June 26th will get $500 via PayPal.